February came all too fast this year. In North Carolina, the second month of the year brings the first breath of the coming spring. But instead of my usual delight at the warm weather, I felt only rising alarm. Ricky and I had yet to plant the first seed on our microfarm, and we were already drastically behind schedule. Sometime in the winter, when our urban farming plan had all been charmingly theoretical, Ricky and I had drafted a lovely schedule of when we would seed start, direct seed, and transplant multiple successions of each crop. Starting about four months ago, we would have stacked delicious layers of manure, grass clippings, compost and other organic treats on our growing beds, building up healthy, fertile soil. The first week in February, we would direct seed beets, radishes and peas into this receptive medium. We would start kale, chard, and lettuce in seed trays, for imminent transplanting. As she fumed, I was purposefully scooping soil samples from all over the field into a bucket. I mixed them together and spooned a bit into a small cardboard box addressed to the Agricultural Extension in Raleigh. They offered free soil testing; within a week or two, we’d know exactly what we were dealing with. We hoped. That night, just before dusk, Ricky and I reconvened on my front porch. Our neighbor, Dave, sat on his own porch, peaceably reading a book in a lawn chair like normal people do. At our house, the porch furniture had been relegated to a heap in the corner. In its place stood a 55-gallon barrel we’d bought for $10 from a man we found on craigslist, a couple plastic buckets we’d found in the yard, and a mound of ingredients I’d picked up from Southern States. “Here we go!” We high-fived geekily before beginning to heap bucketfuls of peat moss, compost, sand, lime, bone meal, cottonseed meal, and vermiculite into the barrel. Confidently, I thrust our famous three-tined pitchfork into the mess and gave it a shove. It barely budged. I tried again. I flipped a little arc of compost in the air, leaving the other 99.9% of the barrel’s contents untouched. Never mind. “Um, how about we roll it?” I suggested. We clamped on the lid and cautiously tipped the barrel on its side. It crashed onto the porch with a resounding thump. Out of the corner of my eye I saw Neighbor Dave jump startledly in the air, casting an alarmed look our way. Heretofore he had been doing a good job of ignoring our antics, but he now watched with a doubtful gaze as Ricky and I bent over together and shoved the barrel down the porch steps. Bam! Bam! Bam! The barrel slammed down to the front walk. Grunting, we shoved it awkwardly forward. Picking up speed, it rolled enthusiastically toward Dave’s truck, parked at the curb in front of our house. Wordlessly, Ricky threw herself between the barrel and the truck. It slammed into her shins, eliciting a sharp cry. I leaped hastily to her side of the barrel and shoved it back towards the house. Now all we had to do was actually plant some seeds. And make them grow and stuff. Buying local is the current mantra for earth-friendly foods. Since writer Sage Van Wing coined the term "locavore" three years ago, many environmentalists consider "food-miles" (the distance traveled from farm to fork) as the best measure of food's impact on climate change. No doubt about it, buying local is good for more reasons than one. It keeps your dollars in your own community, supports family farmers who use sustainable methods, and generates fewer emissions from cross-country trucks. But it turns out that buying local is not the "greenest" diet choice you can make. According to a new study just published in the journal Environmental Science & Technology, the amount of red meat and dairy you consume has a far greater impact on greenhouse gases than the distance your food traveled. Using data from the U.S. Departments of Commerce, Agriculture and Transportation and other sources, authors Christopher Weber and Scott Matthews of Carnegie Mellon University calculated the total greenhouse-gas emissions generated in making and transporting a variety of foods. They concluded that red meat and dairy are responsible for nearly half of all greenhouse gas emissions from food for an average U.S. household. 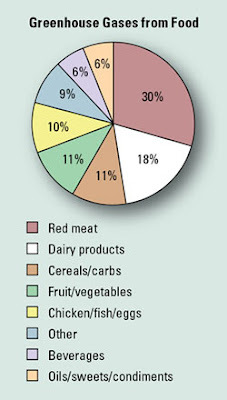 (See pie diagram above by Christopher Weber/Rhonda Saunders, from Env. Sci. and Tech.) That's because the production of red meat and dairy generates much more greenhouse gases than the production of any other kind of food, and much more greenhouse gases than all food-related transportation. The emissions start with the clearing of land for grazing or for raising animals' feed-crops (clearing often involves burning and thus releases carbon dioxide). The chemical fertilizers used for livestock feed-crops are converted to nitrous oxide, another greenhouse gas, by soil bacteria. Cows' burps and the storage of manure in open "lagoons" both release large amounts of methane, another greenhouse gas that traps about 20 times more solar radiation molecule per molecule than carbon dioxide does. "There is more greenhouse-gas impact from methane and nitrous oxide than from all the carbon dioxide in the supply chain [for all our foods]," Weber says. In large part, he adds, this is because nitrous oxide and methane emission in the production of red meat "blows away CO2". Much of this information is not entirely new. Researchers with the United Nations' Food and Agricuture Organization published a landmark paper last year detailing the environmental impact of the world's growing numbers of livestock. If you're interested in the environmental damage caused by livestock, this document ("Livestock's Long Shadow") is one you don't want to miss. It's loaded with great information. Although it's long and detailed, the Executive Summary within the document is only 3 pages and hits all the high points. The authors of the new study from Carnegie Mellon calculated that shifting your diet one day per week from red meat and dairy to chicken or fish or vegetables will reduce greenhouse gas emissions more than your buying all local foods all the time. They didn't go into the environmental impact of fish farms, overharvesting of wild fish, or factory farms of poultry. But we cover all that and more in our new book Going Green: A Wise Consumer's Guide to a Shrinking Planet (May 2008). If you really want to help the planet, eat vegan. And it pains me to say it, because I love cheese. I really really love pepper-jack cheese melted on rosemary olive-oil bread. Oh-my-God, what bliss and comfort. That's the last vestige of animal products in my diet. But with this new study, I don't know that I can keep rationalizing it. Maybe I can find some soy cheese that sort of tastes like cheese. Can any readers recommend a good brand? I have to try. Christopher Weber and H. Scott Matthews. "Food-miles and the relative climate impacts of food choices in the United States." Environmental Science and Technology, 42 (10), 3508–3513.2008. Rachel Ehrenberg. "It's the meat not the miles." Science News. May 1, 2008. Evil is all around us - in the friendly disguise of the “Neighborhood Homeowners’ Association”. I’m not kidding. I’m a biology teacher, and work in a school where the majority of the students are affluent, heavy consumers. I try my best each year to get the kids to recognize the impact of heavy consumption. And, to my joy, I got through to one last week. She was so pumped up she went home and pressured her dad into putting solar panels on their roof. But a problem came up. “Too shabby!” said their homeowners' association. “Not the look we like in this neighborhood." I guess a McMansion with solar panels would look awfully strange. Then it happened again. I went on and on one day in class about buying local food, and even better, growing your own food in a backyard garden. To make my point, I used my harvest records from a previous year. I totaled all of the food I raised in my 6 foot by 20 foot garden one spring. The list was impressive – enough lettuce for 74 salads, plus 41 cucumbers, 27 tomatoes, 13 ears of corn, 57 green onions, 17 bell peppers, 12 servings of Swiss chard, 5 servings of mustard greens, and 3 quarts of raspberries. What a great way to make meat-eating look silly! I certainly couldn’t have grown a cow in my 6 X 20 foot space, now could I? A good point to make with these kids and a good lesson, but could I get my students to follow my lead? Nope. Backyard vegetable gardens aren’t ALLOWED BY HOMEOWNERS’ ASSOCIATIONS!!! 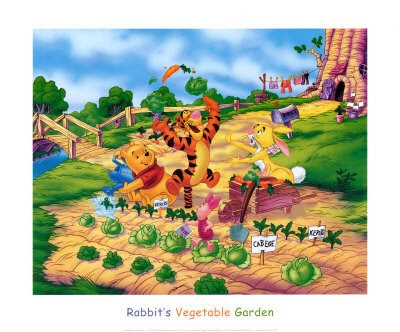 Vegetable gardens are “Too shabby!” What they want instead is a NICE MANICURED GARDEN OF INVASIVE SPECIES!!!!! It happened again. I told the class that at home we hadn’t run our clothes drier for a full cycle in over a year. We air-dry our laundry outside, and save a lot of energy doing so. What a simple, easy thing to do! The clothes smell so fresh…I also enjoy watching the gentle flapping of clothes in a breeze. It’s a peaceful sight. But in the eyes of the typical homeowners’ association this, of course, is also “Too shabby!” NO HANGING LAUNDRY OUTSIDE IN OUR NEIGHBORHOOD!!! ONLY STRANGE LOOKING DESIGNER FLAGS ARE ALLOWED FLAPPING IN OUR YARDS!!! And again! (This really started to make me sick). As Sally has written in other posts on this blog, we have somewhere around 27 chipmunk holes in our front yard. And lots of violets, clover, and everything else but grass it seems. One of my hobbies is identifying butterflies. We’ve seen over 50 species on our property. I like to just sit on our front stoop sometimes and watch. When a good butterfly comes by I dash out into the yard. I wonder what the neighbors think. I could see I was reaching the kids with this example. They thought it was cool. It was an eye-opener for them to learn about the benefit of weeds as food for wildlife. But, alas, the wind was taken out of my sails when we realized that in the eyes of the typical homeowners’ association, this is shabby too. To them, having butterflies, bees, beetles, bugs, violets, dandelions, and clover in your yard is a message to the world that you don’t care about your property. A nice monoculture of grass blades shows love of one’s land. I’m reminded of the old joke where the guy takes a two by four and whacks his donkey between the eyes before he asks it to get going. When asked why he did such a thing, he responded by saying “Well first I have to get his attention!” I’d love to take a nice arsenic-laden treated two by four and whack the president of every neighborhood association president right between the eyes! After I get their attention, what would I say? I’d say this. “I DO CARE ABOUT MY PROPERTY AND THE WORLD I LIVE IN!!! Just look! Can’t you see my garden, my laundry, my chipmunks, my butterflies, my bees, my beetles, my bugs, my violets, my dandelions, my clover…. I was at a Superbowl party when we found the land for our microfarm. All my companions looked away from the game to stare at me, annoyed or curious. “Who has a goat?” Catherine asked eagerly. The grapevine had come to our aid. Ricky and I had been looking for land to launch our urban farming initiative for weeks, months. With both of us tied to rental houses and with nary a penny to our names, buying land was out of the question. We’d petitioned a neighborhood church for use of their vacant field, to no avail. Friends in another neighborhood had offered us use of their spacious yard, but it was a good ten-minute bike ride away. Realistically speaking, I knew that was far enough to keep my lazy self from going over there as often as I’d need to. Weeding my own back yard was hard enough. Nonetheless, it was getting anxiously close to spring. We were on the verge of accepting their offer, when a man named Fred heard from his girlfriend Liz who heard from her daughter Isabell who heard from her friend Jonathan who heard from his girlfriend Ricky that we were looking for some space. Fred had a large lot, agricultural ambitions, and not much spare time. Better yet, he lived just a few blocks away. A perfect match. Our social network came to the rescue again. I heard from my boyfriend Matt who heard from our neighbor Early who heard from our other neighbor Cheryl that Cheryl’s stepdad Max was bringing his tractor to town next week, from his farm in the neighboring county, to till the neighborhood community garden. As it turned out, Cheryl was eager for him to do our lot too. “Doing two sites makes it slightly less ridiculous to bring the tractor all that way,” she pointed out. “The community garden is about the same size as the tractor itself.” Good point. Saturday morning I biked down Florida Street with Max following me on the tractor. We proceeded grandly to Fred’s back yard, holding up low riders who rolled down their tinted windows to get a better look at what was going on. Fred, Cheryl and I stood with some curious children and watched as Max’s tines sank into the tufty clay soil. Slowly, strip after strip of weedy field gave way to chunks of raw red clay. “Wow…” breathed one of the children. I didn’t want to sound like a greenhorn, but I felt the same way. There was no turning back now. Would we really be able to make it as growers? Want to be a food activist? See "Top 10 Eco-friendly Diet Choices" for easy steps to "eating green." Or have a look at "Car Addiction" for Sadie's recent musings about her household's reliance on cars - and what to do about it. 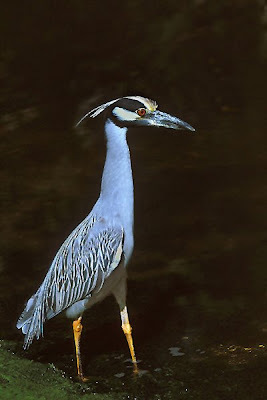 Ken Kneidel will present a slide show about the population of Yellow-crowned Night Herons that live in suburban Charlotte, NC. The show is at the monthly Audubon Society meeting Thursday May 8 at 7:30 p.m. So skulk on over to the fellowship hall of the Sharon Seventh Day Adventist Church (920 Sharon Amity) for the meeting. Refreshments start at 7:15 p.m. Don't forget to bring a cup for your coffee or soda. track of these elegant birds for a number of years now. Yesterday morning the tables turned. Now, pretty much every Saturday morning finds me at the farmers' market. That's not unusual. Maybe it's the hot coffee, or perhaps it's the 15 kinds of goat cheese available for sampling, but I have the uncanny knack of waking up on Saturdays without my alarm clock, if I know that's where I'm going. Before I go to bed, I tell myself, "You can have plantain spring rolls for breakfast if you wake up in time!" It works like magic. But this Saturday was dif ferent. Don’t get me wrong, I was still eating spring rolls - but as shoppers strolled around our neighborhood's fledgling Peoples' Market, I sat firmly planted in a seat. Behind a table. My table. My gardening partner Ricky sat beside me, making change and small talk as I slid our products closer to the front of the table, freshened the herbs, and rearranged the flowers. I kept expecting someone to cry, "Hey you! You're not a farmer! What are you doing?" But they didn't. They just bought our plants and smiled. This trimphant morning was the result of four months of planning, working, and waiting. A cold afternoon in January, Ricky and I sat at my kitchen table with two mugs of tea and a stack of heirloom seed catalogues. "I know it's crazy," I said, "but we have to try this. I had this moment this afternoon... I was watering the collards in the back yard, and I was filling the bucket from our rain barrel, and all of a sudden I was awash in this wave of… like… pure joy. A wave of… I don't know how to describe it. Realness. Like, at that moment I was my authentic, unadulterated self. I don't get that feeling from anything else I do, besides gardening and farming. And maybe cooking." Ricky grinned at me, half-teasing, half-understanding. "I know exactly what you mean," she said. "I get that feeling too. Very occasionally. When I'm doing something that I really believe in, that feels right and true to me. Like I'm taking a step towards I believe in." "God, we're so cheesy," I groaned. "Anyone who is listening to this conversation is barfing on themselves right now. But seriously. I don't know how else to say it except that I feel really called to try this. And I want to give it a shot." And so, armed with almost no materials, we set off on our revolution. With less than $300, two shovels, one hoe, and a three-tined pitchfork, we devised a plan. Our goal: agriculture in the city. Reaquainting ourselves and our community with food and agriculture, the fundamental skill of survival. Providing fresh produce for our working-class neighborhood; earning a living by following our passion; severing our community's dependence on agribusiness; protecting our food supply by propagating heirloom seeds; mitigating our environmental footprint by growing local food. Back in January, I couldn't decide if we were insane or brilliant. (Sometimes it's a fine line.) We had no land. No money. No machinery. No tools. No model, no plan, no infrastructure. And yet… we did have supportive friends. A needy community. Passion and excitement, and a habit of getting things done in the most bootleg manner possible. Today, in May, I'm still not sure whether we're nuts or not. Our project is still in its infancy. Our finances are still most definitely in the red. But we're learning a lot - about plants, but also about our community and ourselves. In the past few months I've read a lot of books and watched a lot of documentaries about revolutionary agriculture. Those stories, the knowledge that other nutty people are out there doing the same thing we are, has made me realize the importance of telling our story. Over the next few months, I hope to catch readers up on the first few months our urban agriculture adventure, and keep you updated as the summer unfolds. There's drama in the dirt. Here in the South our local birds are well into their nesting season. Around the yard I've seen active nests of robins, cardinals, and Carolina wrens in the trees and shrubs. Won't be long before their young are fledging and at their most vulnerable stage. The migratory warblers that nest farther north are coming through our area too, from their wintering grounds in Latin America. We can hear their calls in the trees behind the house. The chipmunks are up and about too. The entries to their nest holes are tidied, and I see the mamas darting around the yard looking for anything edible. The little nurslings are underground now, but they'll be up above ground soon. Last year I saw a mom with three babies, all sitting straight up like little meerkats. I love this time of year. But I hate it too - because I know before long I'll see my neighbors' cats carrying songbirds and struggling chipmunks out of my yard. If this year is like last year, I'll see the cats hunting in my yard every single day. There is nothing "natural" about housecats preying on native wildlife. Cats are an introduced species, and like kudzu or honeysuckle, they are not affected by the natural checks that limit the numbers of native species. Housecats are kept in prime hunting condition by the feeding and medical care they receive from us. They are far more efficient hunters and are far more numerous than any naturally occurring predator ever was. Unfortunately, bird populations are already suffering from habitat loss and other human impacts. House cats are one additional blow - one that we could control easily. If you have a cat, you might want to know that hanging a bell on the cat does not work, nor does declawing. The only thing that stops cats from killing native wildlife is keeping them indoors. If you have a cat, you might also like to know that your cat's life expectancy will be much higher if you keep it indoors. 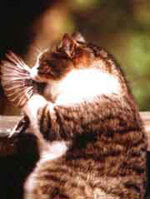 Roaming cats can expect to live an average of less than 3 years, while indoor cats can expect to live 15-18 years. I did, a couple of years ago, go talk to my neighbors about their cats. I begged them to keep the cats indoors. I gave them reprints of all the articles cited here. But they said the kitties would be unhappy indoors, so the kitties still roam. HSUS, the Humane Society, has a great paper about the benefits to cats of living indoors, including the improved life expectancy. Indoor cats are safe from cars and other accidents, and have fewer illnesses. A 2006 paper by ecologists in Wisconsin lists a number a resources and other papers that will be useful to anyone researching this topic. This University of Maine paper says that there were around 30 million cats in the U.S. in 1970. The paper estimates that there are now around 100 million in the U.S.